It’s a big call, we know, but we’re doing it: Eminem will be releasing a new album within the next few months. As the years have passed, Marshall Mathers has been quieter and quieter, and his lack of presence on social media sticks out like Frank Ocean’s sore thumb. There’s hardly been a flurry of activity or footage of him in the studio or anything like that, but there have been enough small hints suggesting new music that we can’t deny the plausibility. The biggest indication of new music is obviously new music, and we were blessed with exactly that last October. Eminem delivered one of the most fiery freestyles of 2016 with Campaign Speech. Seemingly released in response to the then-impending election of Donald Trump, it was nearly eight minutes of venomous, funny, socially aware, and of course, controversial lyrics in a freestyle that ran nearly two minutes longer than the MMLP2 standout Rap God. The release came with a tweet announcing that he was working on a new album. So there’s that too. A guest verse is no big deal for some, but when it’s Eminem, you take note. He’s not one to flit around, flinging guest verses and collabs any which way. He only featured on two songs in 2016, Skylar Grey‘s Kill For You and KXNG Crooked‘s Welcome to Planet X (We’re Coming), which also featured The Observer. These were both largely out of the spotlight, Em choosing to work with smaller Shady Records affiliates over big name artists. He was only slightly more active in 2015, appearing on a Weeknd remix, two songs from the film Southpaw, and a feature on (Shady Records artist) Yelawolf‘s last album. This year he’s appeared on the Big Sean track No Favours, easily his most notable feature in years, particularly considering Sean is signed to G.O.O.D, not Shady. Hitting 22 on the Billboard charts, it’s his highest charting track since 2013 when The Monster ft. Rihanna hit no. 1, and his highest guest verse since Dr Dre‘s I Need A Doctor in 2011. So while he’s not exactly more prolific, it is interesting that he chose to work with one of the biggest in the game right now. Whether it’s a simple matter of respect for Sean or a calculated move to draw exposure from a younger generation ahead of new music, is anyone’s guess. This is a moot point, but it sparked a lot of conversation a few months back, so we couldn’t fully ignore it. 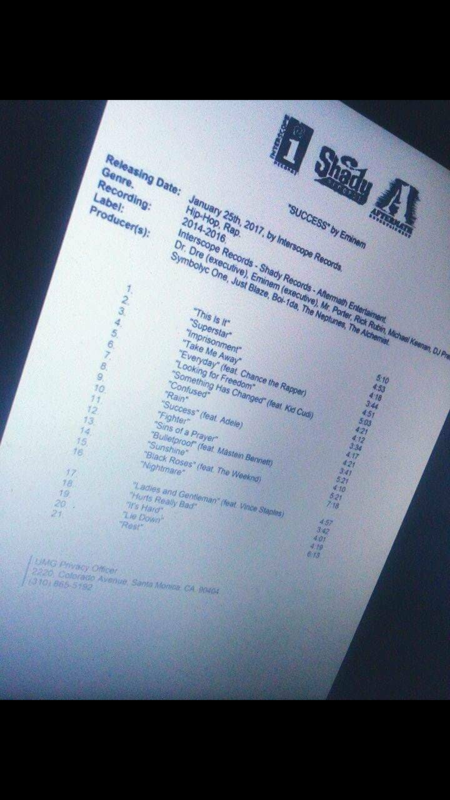 Last year a fake”leaked” document did the rounds on Reddit, with a tracklist, featured guests etc., including a release date for January 25. All details can be found below. Frankly the name Success in pretty stupid. It’s 100% fake, especially considering the weirdly stacked guest list and kinda stupid track names. So while it’s not worth paying any real attention to it, you may as well consider the possibilities. It’s not real. I repeat: it’s not real. But, it did start many conversations. 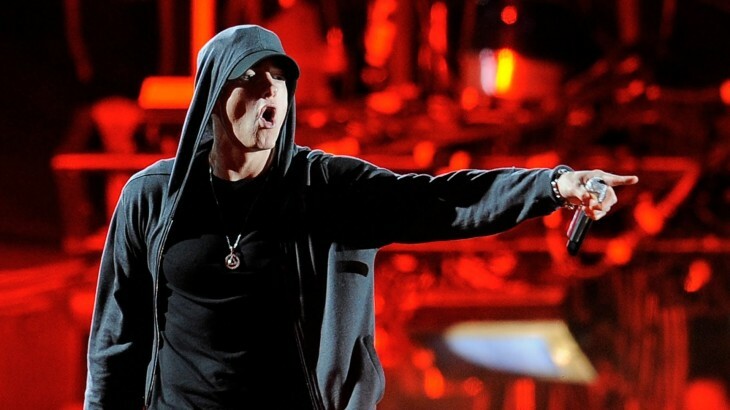 Most telling is that Eminem has locked in two live dates, headlining Reading and Leeds Festival in the UK this August. It’s extremely rare for an artist to randomly book a headline slot without having any new music to show for it. Usually, tour dates are a great sign that new music is on the way – for example, artists including Lorde, Queens of the Stone Age, Father John Misty and Future Islands are all booked in for Coachella, all of whom have either announced or hinted at new music on the way. Unless we’re talking about an old band from the 60s or 70s who have come back for a reunion show, there’s almost no way an artist would just randomly be booked for a headline set without new music. So far Reading and Leeds are the only dates he’s announced. Considering it’s one of the later festivals of the season, taking place in the last week of August, it’s likely the album won’t be out in time for Coachella (April), Glastonbury, Bonnaroo or Governors Ball (all June) and so on. This is all just speculation of course, but we have a good feeling about it. With all said and done it’s looking likely the album will be out in June or July, although it’s highly possible the album will be out earlier, and Eminem just didn’t want to play at earlier festivals. He hasn’t embarked on a full tour since 2014, so we imagine he’s got a lot of rehearsing to do first.